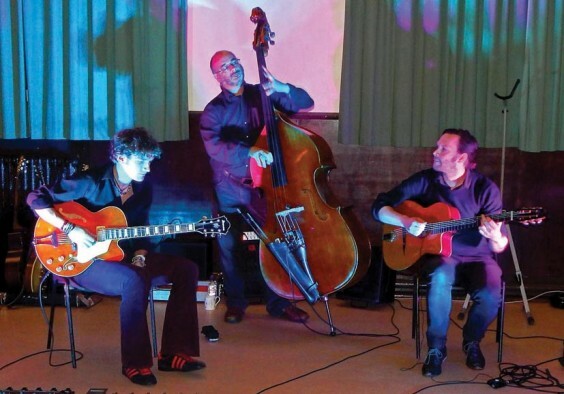 An up-and-coming jazz guitarist made a welcome return visit to the area following a successful September concert at the Artrix. The inspired choice was the first offering from the newly-formed Trinity Community Theatre, an initiative from Lickey & Blackwell and Cofton Hackett Parish Councils under the ‘Shindig’ umbrella. Remi Harris had the 60-plus strong audience enthralled by his dancingly dexterous fingers and lively rendering of classic songs. From the opening Can’t Buy Me Love and Putting On The Ritz through to a soulful rendering of Somewhere Over The Rainbow, all manner of genres were adapted to his Gypsy Jazz style. The interaction with the audience was laced with humour as Remi, born and bred down the road in Bromyard, engaged his already captivated and appreciative foot-tapping fans. Looking more 17 than his 27 years, Remi is pretty much self-taught since saving pocket money to buy that first guitar at the tender age of seven. The improvisational nature of the guitar, the encouragement by a like-minded dad and listening to his heroes such as the Fab Four, Zeppelin, Reinhardt, Hendrix and Knopfler was a lure too strong to resist. Nominated for the British Jazz Awards 2015, the accomplished Remi is ably accompanied by Caley Groves on guitar and Mike Green on double bass, with a heady mix of blues, swing, hip hop and world music. The sympathetic ‘bistro’ layout (tables with candles, to you) of the Trinity Centre venue and the intoxicating recipe of sublime music was a triumph. Their next local gig is at the MAC in Edgbaston on December 4 – see http://www.remiharris.co.uk for more info. So, be there or be square, man.